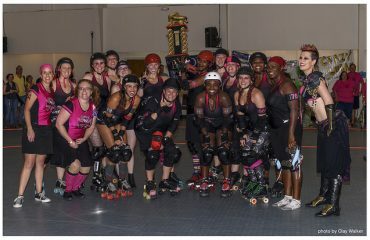 Game One of the ARG June double header featured reigning league champions, the Apocalypstix, battling against the Denim Demons. Tensions were high as this game determined seeding for this year’s championship game. The Stix had lost both of their prior games and needed a huge win to be in the running for the league title again. The Demons, who had a previous win against the Sakes, a team the Stix lost to earlier this season, seemed to be a sure bet for taking the game. It was the Stix however, who put the first points on the board. The Stix continued their momentum with large scoring runs and put an impressive 103-18 up within 15 minutes of the game. The Demons fought back in a big way, and in the remaining 15 minutes of the first half, they put close to 50 more points on the board, but it wasn’t enough to stop the momentum of the reigning champs, ending the half 188-63, Stix. The Demons slowly started gaining momentum in the second half. They took advantage of several Stix penalties, but the Stix continued to fight back, using offensive strategy to take advantage of a few power jams in return. Ultimately, this year’s reigning champs were able to keep control of the game and ended the second half 261-155, Stix. It was exactly what they needed. The Stix will return to this year’s championship game to defend their title. 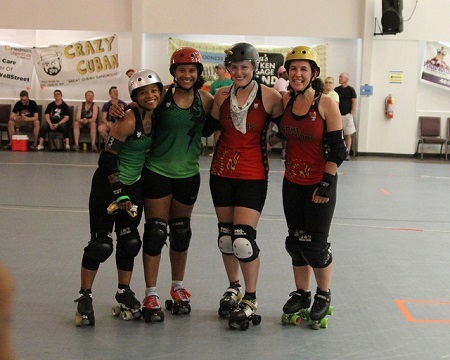 Game Two of the ARG June double header featured the undefeated Toxic Shocks taking on the 1 – 1 Sake Tuyas. The outcome of this game was the last determining factor of which teams would go to champs. Although the Shocks put the first points on the board, the Sakes never let them gain control. The grueling defensive formations from both sides lead to three lead changes before the Sake’s pulled a lead of just 18 points before the first half ended 77-59. The second half began with a couple small scoring runs for the Shocks, but the Sakes retaliated by throwing 37 more points on the board. In the middle of the second half, the Sakes were leading 114-77, but after a 15 point powerjam, the Shocks slowly started to gain control. For five jams, they kept the Sakes from gaining more than six points as they continued to put small scoring runs on the board. The game was tied 120-120 with just over two minutes remaining on the clock. The Shocks took the lead, but the Sakes were a mere two points behind when the game clock was timed out at less than 30 seconds remaining. When the game clock ended, the two teams were tied again. 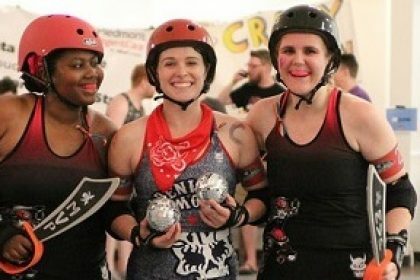 The game went into the extremely rare occasion of overtime.– In roller derby overtime, there is no “lead jammer,” which means no call-offs. There is also not an establishing pass that jammers must make in order to begin scoring points. They score points by passing the hips of an opponent as soon as the whistle blows.– The Shocks and Sakes traded passes until the Shocks finally pulled ahead by seven points for the win 152-145. The Shocks will be entering this year’s championship game undefeated.